The Week At a Glance Report is accessed from the main menu under Reports > Attendance Summary . It is configured by your church’s TouchPoint administrator to contain the Programs and Divisions for which your church tracks attendance on a weekly basis. These might be Sunday morning Worship Services, Life Group Classes (Small Groups), Wednesday evening programming, and others. Enter a Sunday date to see the Week at a Glance for that church week. If you include Wednesday night activities, the report will include the Wednesday prior to the Sunday you specified. In other words, the church week runs from Wednesday through Tuesday. While the Week at a Glance is a summary style report, with each row representing a Division, it is designed for you to click on any of the totals to drill down to the Meetings Report . 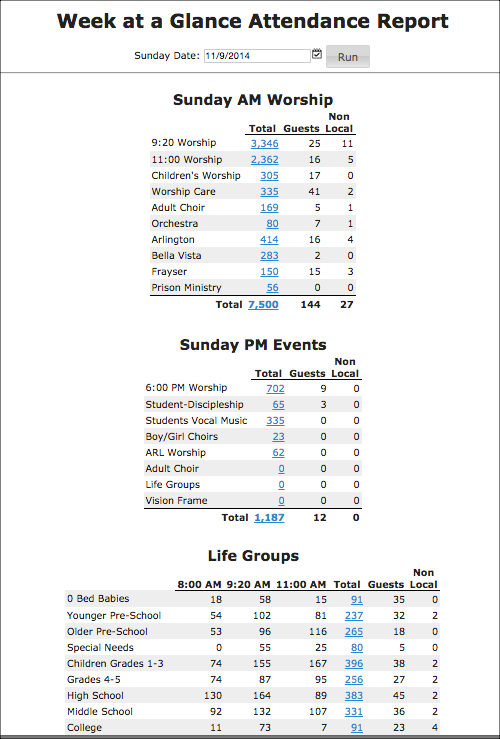 This report displays all of the organizations included in the total from the Week at a Glance with one row per meeting. And, each row contains links to drill down to the individual Meeting (click the date/time) or to the organization (click the org name). We have a separate article with more detail about the Meetings Report. You may be interested in our webinar named Meetings/Attendance/Week at a Glance. While this was recorded several years ago, and a few things have changed slightly, the basic principles still hold true. This demonstrates how to set up your own Week at a Glance report for your church, so that you include the major events your church wants reported each week. Our companion article to this one gives you the details (specs) of configuring the report to fit the needs of your church. In the image below, notice the numbers that are blue. Those are the links to drill down for more information. There is no extra set up required for the Average Week At a Glance Report. It is just like the Week At a Glance, except that it can be run for a date range to get an average. You have the option of omitting specific dates from the report. This is useful for Sundays when you have Worship, but small groups don’t meet, perhaps on Easter. Because the report has averages, you cannot drill down to the Meetings Report. If all your division lines contain the same number of weeks with attendance, then the total average will sum up nicely. However, if some rows have fewer weeks than others, then the sum of the averages will not equal the average total shown. Click on the following image for an explanation of why this is true.